a ninja site a site for fans of ninjas. 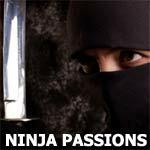 body mind and spirit -oneness the Ninja Way I have no idea if one is born an ninja. I feel that the old clans that were ninja, understood a healing way with the body and mind and spirit that transcended to a place we have forgot, and that we can learn the healing of that way again, and i would like to learn it. i have found some things to learn. Does alpha11 belong in this group? Blue eyed ninja Im a medium sized guy who stays physically fit. I am a certified personal trainer and a full time student. I study tradional ninjutsu and samuri bushido. Im a nice sweet traditional kind of guy who is down to earth and I dont judge people. I accept people for who they are. Does indepbadboy belong in this group? I love ninja's, and girls who do! Does karnaloth belong in this group?